1 Sift the flour and icing sugar into a mixing bowl and rub in the butter until the mixture resembles breadcrumbs. 2 Stir in the egg yolk and just enough water to form a dough. Knead lightly until smooth, then wrap in clingfilm and chill for 30 minutes. 3 Heat the oven to 190°C (170° fan) 375°F gas 5. Line 24 mini muffin tins with foil muffin cups. 4 Roll out the dough on a lightly floured surface, about 2mm| 1/6" thick. Cut out rounds using a 6cm|2 1/2" cookie cutter. Line the foil cups with the dough and prick the base with a fork. Stamp out mini stars with the trimmings. 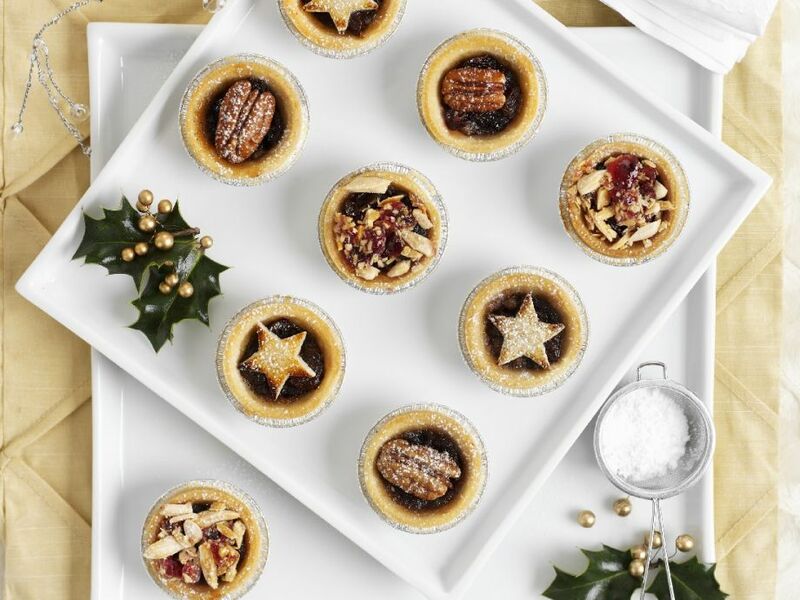 5 Spoon a generous teaspoon of mincemeat into each pastrycase and top with a mini star, whole pecan nut or slivered almonds and cranberries. 6 Bake for 12-15 minutes until pale golden. Cool in the foil cups and sift over a little icing sugar just before serving.